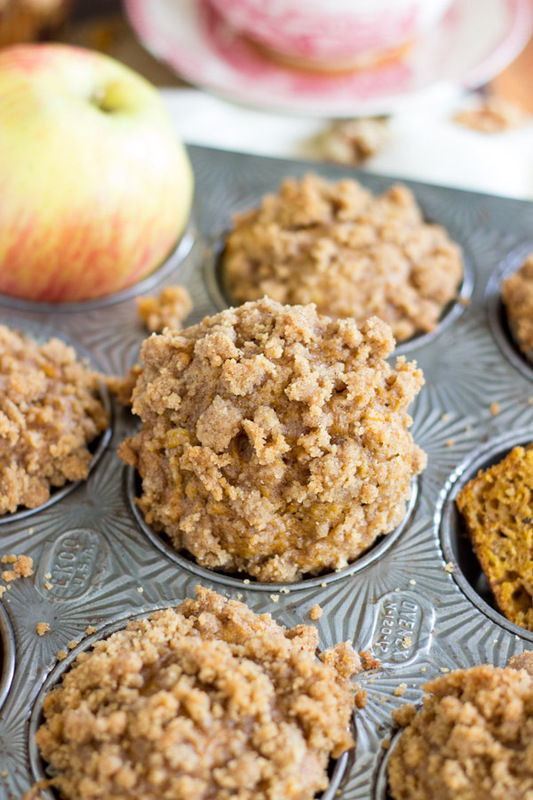 These flavorful pumpkin muffins are ultra-moist and sweet with the addition of grated apple! 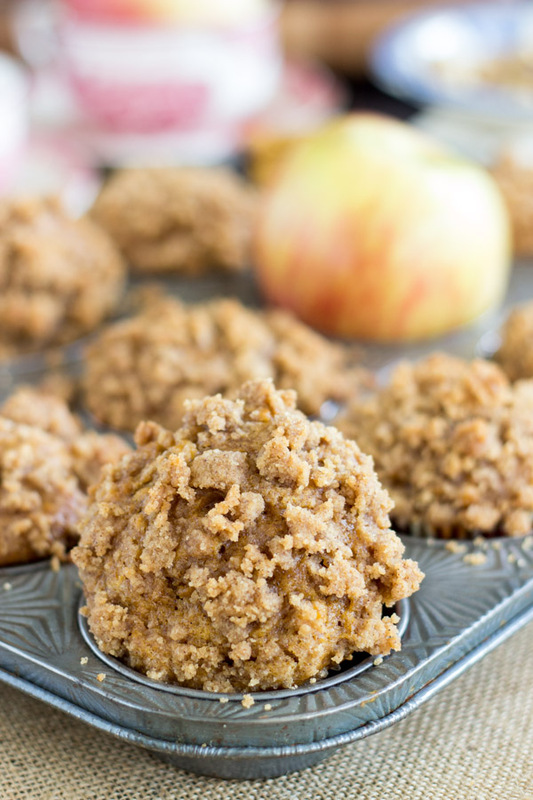 With lots of crunchy walnuts, and a sweet, buttery, cinnamon streusel on top! The day I made these, I was at the grocery store four times, and I still went again the next morning. I also made four cheesecakes that day (including this one), and a bread recipe. The oven was on non-stop for hours. Each cheesecake takes about an hour to bake, so it was a marathon. I never get everything I need in one grocery trip. Something always gets forgotten! In this case, I ran out of apples. There was a lot of apple stuff happening. I have an apple pie coming up, two apple crisp recipes, and an apple cake. I couldn’t keep enough apples in the house. But I really wanted to make these muffins. Back to the store, I went. Then I needed brown sugar, then sweet potatoes (not for the muffins though), and then pumpkin pie spice. I blow through that stuff in the fall, and I wish they sold it in bulk from Sam’s Club. 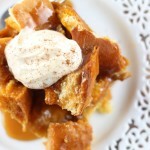 Bulk pumpkin pie spice is a must. All of these items scream fall, and the only thing missing that would complete the fall shopping list would be pumpkin, but I had the good sense to stock up on pumpkin weeks ago, so I was actually all set, as far as that goes. I don’t love ending up at the grocery store as much as I do, but it’s worth it when I turn out a recipe that I’m proud of, and that I look forward to sharing. 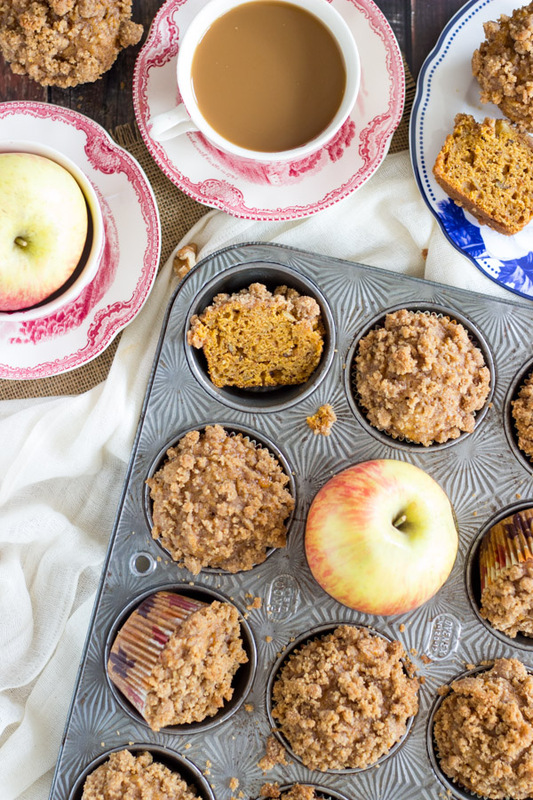 I love that these muffins combine a bunch of fall favorites in one: apples, pumpkin, walnuts, and spice. You pick up on all flavors, and none dominates overwhelmingly, so it’s a lovely marriage of everything. They’re incredibly moist and sweet, and loaded with spice. 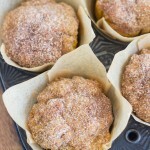 If the muffin itself isn’t wonderful (but it is, I promise), it’s topped with a buttery, brown sugar-cinnamon streusel. I never met a streusel-topped baked good that I didn’t like. 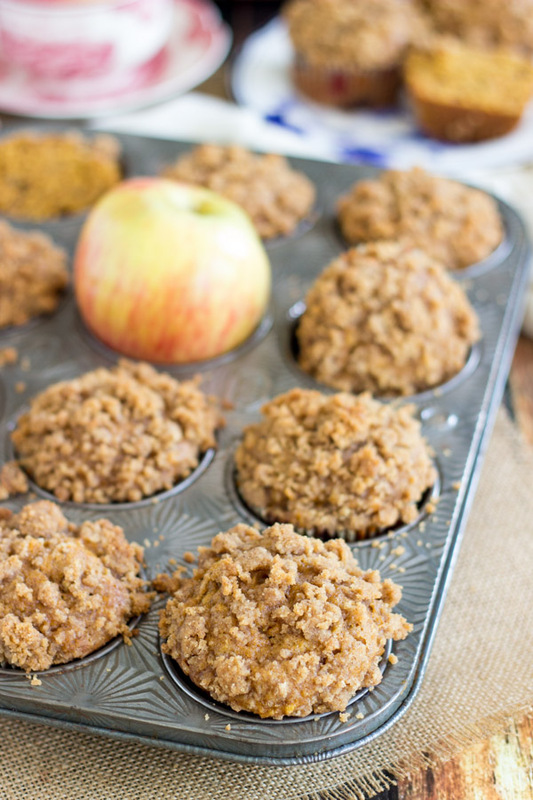 These will have your whole house smelling like fall, and they make for a delicious breakfast to throw together on weekends. 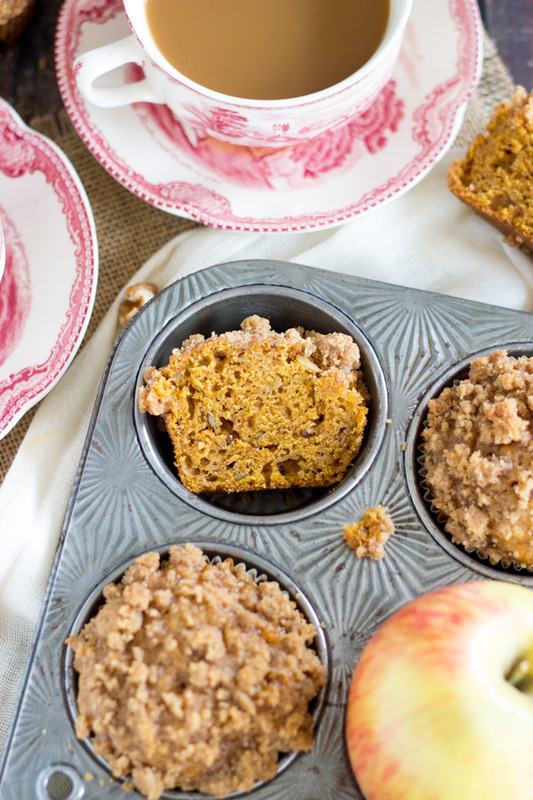 These flavorful pumpkin muffins are ultra-moist and ultra-sweet with the addition of grated apple! 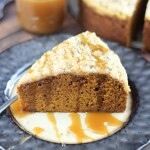 With lots of crunchy walnuts, and a sweet, buttery, cinnamon streusel on top! In a large bowl, combine flour, sugar, brown sugar, pumpkin pie spice, cinnamon, ginger, clove, baking soda, and salt, stirring until blended. 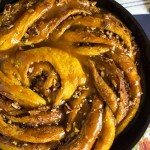 In a medium bowl, combine eggs, pumpkin, oil, and apples, stirring until blended. Line 24 regular-sized muffin cups with paper liners. 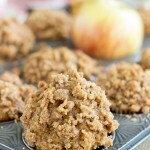 In a small bowl, combine brown sugar, flour, cinnamon, and butter, mixing until it resembles coarse crumbs. 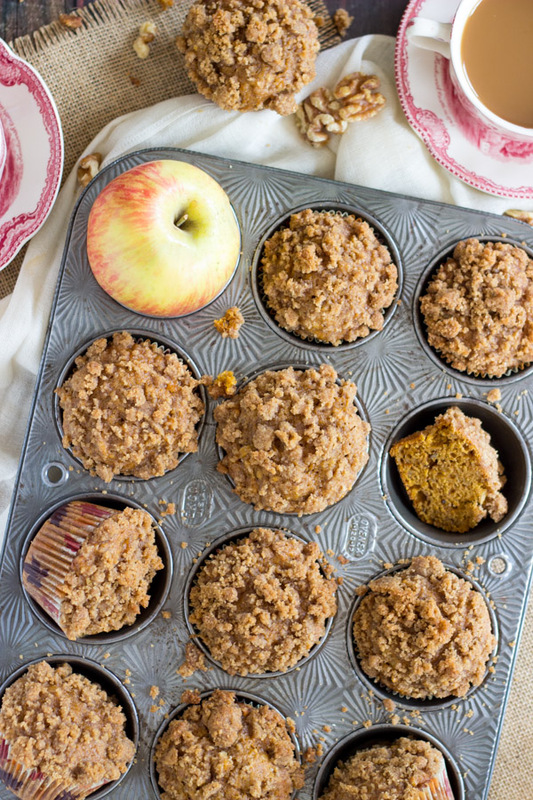 Sprinkle a generous tablespoonful of streusel on top of each muffin. 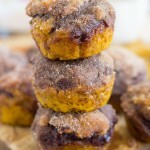 Bake at 350 degrees for about 25 minutes, or until a toothpick inserted near the center of a muffin comes out clean. And I can totally relate to the multiple-trips-to-the-grocery-store problem: happens to me all of the time! I’m constantly distracted by 1, 2, or 3 kids in tow (who are begging for things like Lucky Charms cereal), and then I forget what I really need! You’re the fall baking QUEEN. Can’t wait to see what you come up with next!